Lot 306: Agent Marked C. Suter Selma AL Derringer, .45 cal. 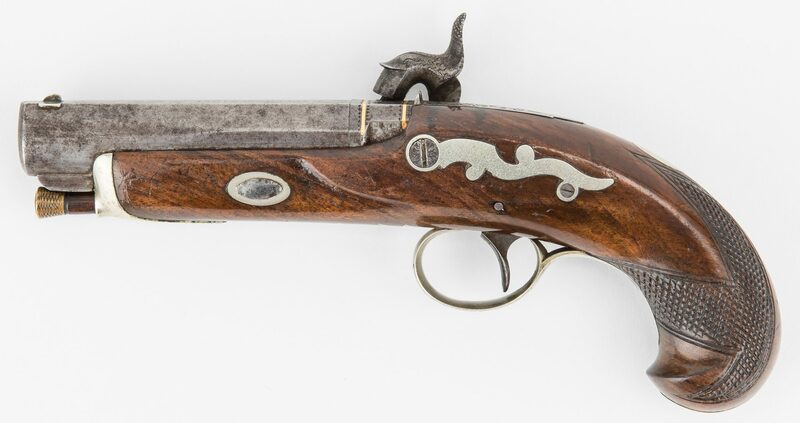 You are here: Home >> January 26, 2019 Historic Winter Fine Art and Antiques Auction >> Lot 306: Agent Marked C. Suter Selma AL Derringer, .45 cal. 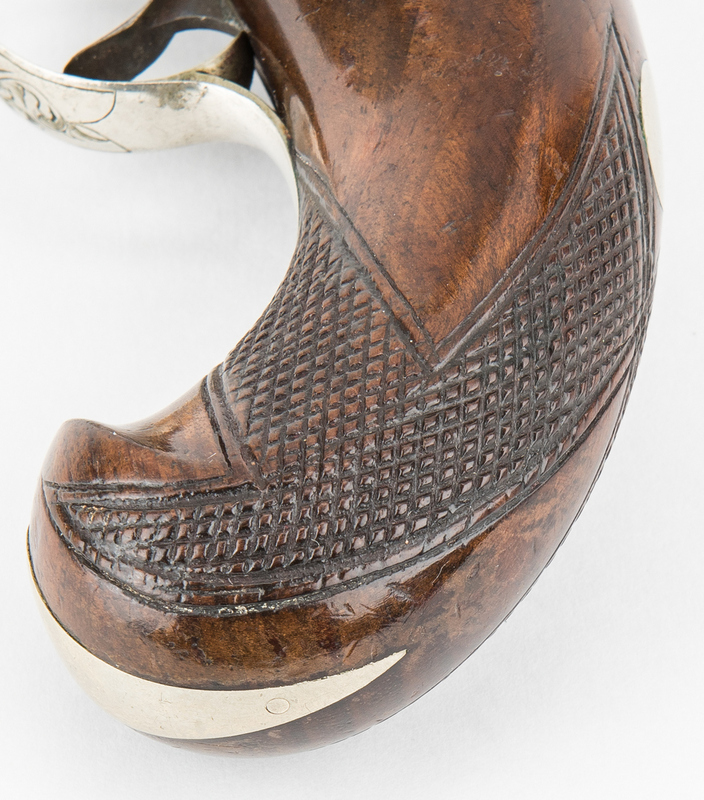 Scarce Suter, Selma ALA Agent Marked Derringer in Original Condition. 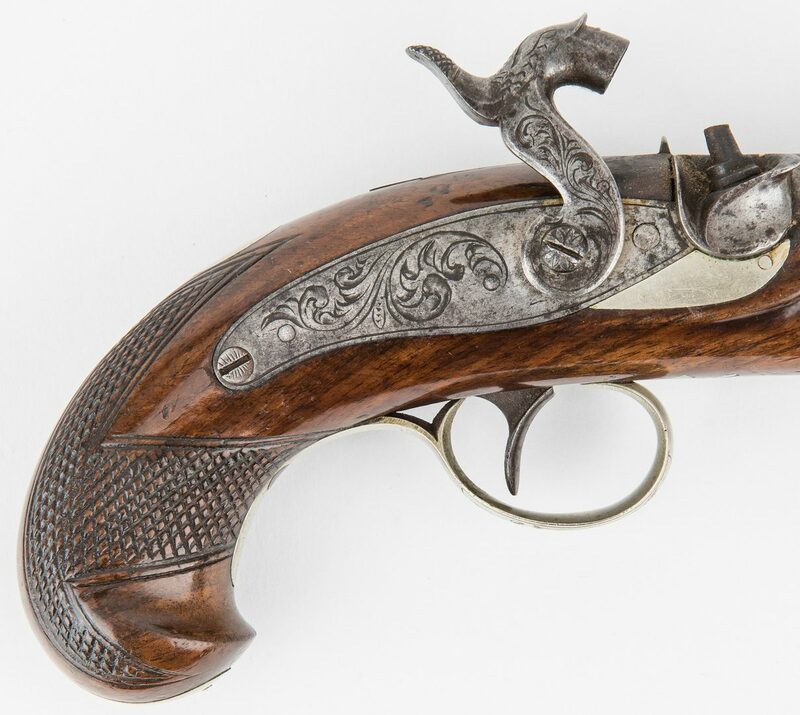 Marked Casper Suter Derringer, manufactured by Wurfflein, .45 caliber. Top of barrel marked "C. Suter Selma Ala". 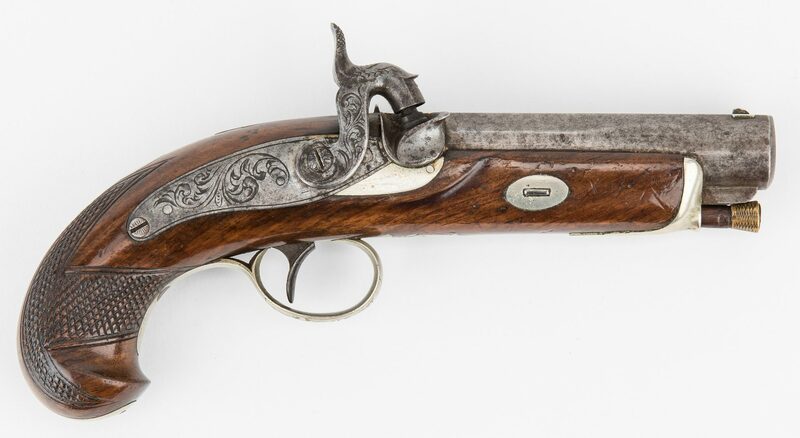 Checkered American walnut stock, octagonal barrel, top of breech inlaid with two gold bands, German silver mounted with foliate engravings on the trigger guard, lock, hammer and barrel tang, checkered hammer, standard front sight, and original ramrod with brass tips on both ends. Includes receipt from Damon Mills Fine Antique Guns & Swords and sale record. 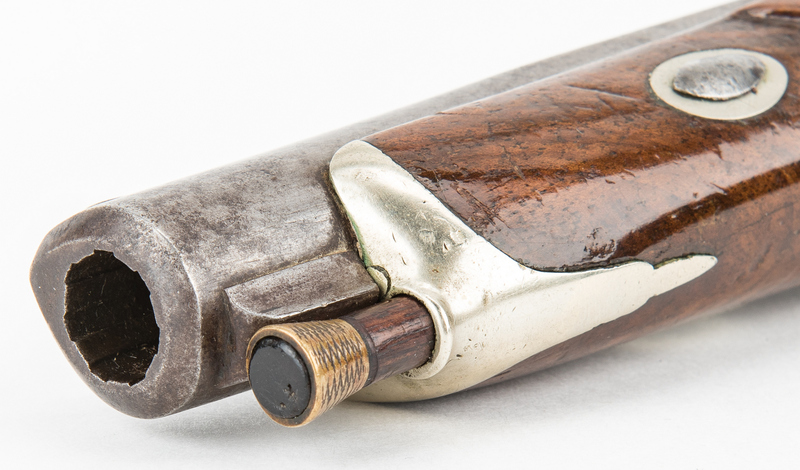 Barrel length – 4". Overall length – 8". Circa mid 19th century. 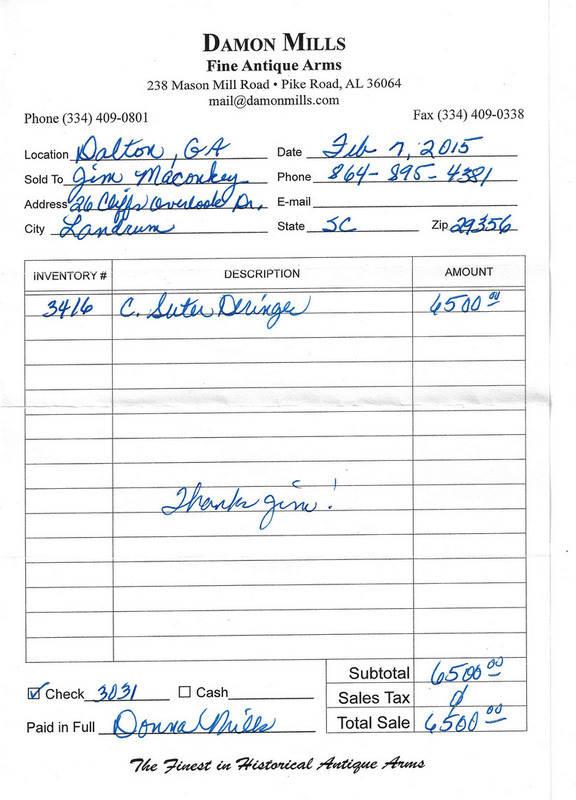 Provenance: Estate of Jim Maconkey, Landrum, SC. Note: Casper Suter of Selma, Alabama was working 1796-1873. For an example of a similar deringer, see "The Derringer in America" Vol. 1, by Robert Lawrence Wilson and L. D. Eberhart, page 146. CONDITION: Action is good. No visible finish visible on metal. 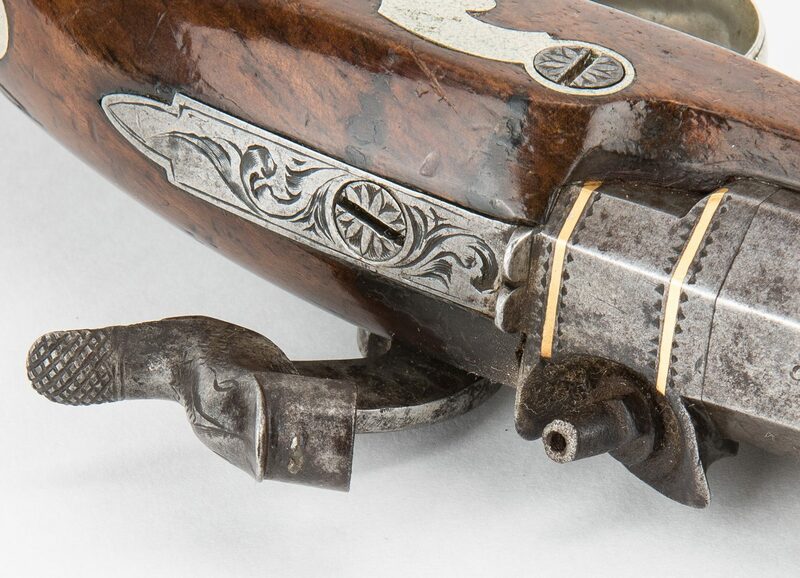 Checkering on stock is well defined with 50% varnish present. Ramrod is original.